Well-established educational suppliers, Early Years Resources, are proud to announce the launch of their very first series of dedicated workshops for early years practitioners, childcare providers and teachers. 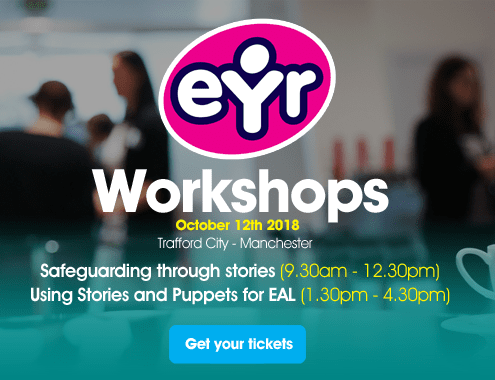 The first two EYR Workshops are taking place on the 12th October 2018 at the Holiday Inn Express in Trafford City, Manchester and will explore key topics on ‘Safeguarding Through Stories’ and ‘Using Stories and Puppets for EAL’. Each session will be delivered by inspirational storytelling specialists and Teach Early Years award-winners, Tonya and Natasha from Little Creative Days, and is guaranteed to leave you walking away with a wealth of new, fresh ideas to take back to your setting. The first EYR Workshop session on ‘Safeguarding Through Stories’ will show you how you can use stories, props and storytelling techniques to identify safeguarding issues and help you decide whether you need to initiate your setting’s safeguarding procedures. The other EYR Workshop looks at ‘Using Stories and Puppets for EAL’ and will show you how stories, story-related products and puppets can help engage children with English as an additional language (EAL), develop their English language and help them feel included. Both EYR Workshops are practical, interactive sessions that will provide you with lots of advice and essential tips, as well as a rewarding and stimulating experience. 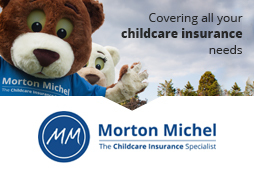 You are sure to leave the sessions with a wealth of knowledge and new ideas to enrich the children’s learning, development and welfare and help you maintain outstanding levels of childcare. Be inspired to unlock the potential in your setting! Find out more about the upcoming workshops here. Established in 1992, Early Years Resources is a reputable supplier of innovative and cutting edge educational resources and equipment to educational establishments throughout the United Kingdom and worldwide. The team consists of experienced teachers and specialists buyers who are at the forefront of the latest developments and initiatives in education. Tonya and Natasha, the storytelling sisters, are authors of a series of books about a little dog called Pojo who gets itchy paws and goes off on adventures. They have won multiple awards for their puppet making kits that accompany the stories.